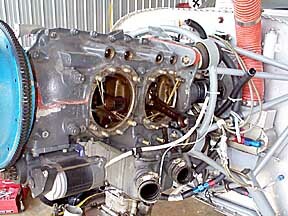 The O-320 E2D in 399SB was purchased used from Wentworth salvage in Minneapolis, MN. It had good logs and 1192 hrs since a Lycoming overhaul ten years ago, the compression checked good and the prop flange was not bent. However, at least three of the cylinders had been off for repair at various times. 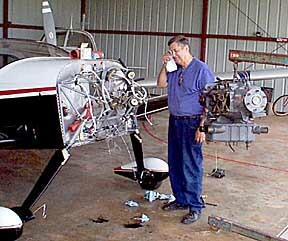 My intention was to fly the engine for awhile and then overhaul it at my convenience. This is a good route to take if you don't want to pop for a new engine up front as part of the original construction expense. I was able to test fly the airframe without having to break in a fresh engine simultaneously. The engine has run very nicely and the 150 hp (more or less) gives satisfying performance with the fixed pitch prop. I have been noticing some signs that possibly not all was well with the motor. The oil turned dark just a few hours after a change, and every time the filter screen was cleaned, a small amount of metal was evident. Also, when the prop was pulled through by hand, a couple of cylinders were definitely getting soft. A compression check revealed that one cylinder was down to 40/80, and the others were on the way down. Air could be heard leaking past some of the exhaust valves and into the crankcase. It was time for action, ready or not. The plan was to pull the cylinders, look for rust and/or galling on the cam and lifters, and replace just the cylinders if the cam and lifters looked good. I was betting the crank would still be serviceable after just 1400 hrs, and hopefully the engine would be good for a long time with new cylinders. On the appointed evening, the cowl was pulled, and various hoses, wires, and stuff was disconnected so the cylinders could be accessed. Off came the baffles, headers, and intake tubes, and soon the bare cylinders were ready to be attacked. These are very simple engines. 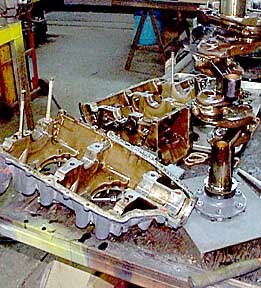 Once the valve covers are removed, the rocker arm pins can be slid, or gently tapped if necessary, out of the bosses, the rocker arms removed along with the pushrods and tubes, and all that remains is the removal of several nuts at the base of the cylinder. A specially formed wrench makes short work of loosening the nuts, and the cylinder can be pulled off the case. 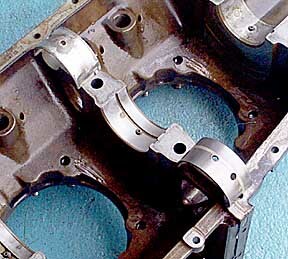 Care needs to be taken to prevent the connecting rods from striking the cylinder bores in the case, and the piston pins are a slip fit in the pistons. This is what you see once the cylinders are removed. I am always amazed at the massive proportions of one of these engines. The pistons are huge! It is easy to see the 1930's agricultural roots of the design, and why these things can usually run near rated power for hours on end. Now the cam and lifters can be examined. The arrow points to a cam lobe and a lifter for the opposite cylinder. I eagerly pointed a flashlight into the abyss and the first two lobes and sets of lifters looked nice and smooth. One lobe and its pair of lifters had taken a real beating. The surface of the lifters looked like they had been attacked with a ball peen hammer. The cam lobe had a sliver of metal sticking off the side that was so sharp it slit the end of my finger when I checked for pitting. Yes, we do have blood, sweat, and tears in our airplanes.........and here is Bob Butler shedding a few after seeing that 399SB was going to be ground bound for awhile. Actually, I think he was just heartbroken to realize I was going to be too broke to buy him lunch for several months. Even though the galled cam and lifters was definitely not what I was hoping to see, there is a silver lining to this cloud. I am glad I caught this situation now instead of possibly dealing with the consequences later. The plane is going to get a rebuilt engine, and its innards will be well known to me which will bolster confidence in the plane. This RV-6 is a keeper which I intend to fly literally all over the country, and a rebuild should assure me of several years of relatively trouble-free service. This is where we are after about eight hours of labor. Only four bolts remain holding the case together, the sump has been removed, and I am about to carry the whole shebang to my A&P friend where we will formulate our plan of attack. Today the engine went to the shop of my local engine guru. We split the case to see what we are really up against. In addition to the cam problem, we found that the case had a mild case of fretting. This is a malady caused by the case halves moving in relation to each other and eventually leads to oil leaks between the case halves. 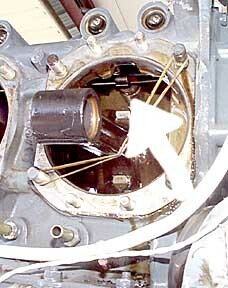 Of greater concern was the appearance of the center main bearing. It was obvious that it had been working around in the case (we are talking about tiny movements here, but still entirely unwanted). Notice the backside of the bearing in the upper left of the photo. This is a normal bearing and has a splotchy appearance which shows it has remained tightly in place in the case journal. Contrast that bearing with the one in the lower right corner with the smooth, matte surface which results from the bearing "polishing" itself as it works in the case journal. This is not uncommon for center bearings in Lycomings, but is something we want to avoid. Not as obvious in the photo is the similar appearance of the case surface around the center journal which likewise indicates relative movement of the case halves. This is more apt to occur after a couple of cylinders have been removed for service and the case is slightly warped upon their re-installation. You can also see the difference in the appearance of the center journal and the journal in the top right corner of the photo. 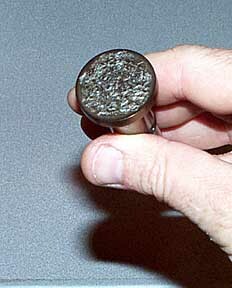 The upper journal looks normal and indicates that the bearing remained stationary. You are looking at a severly spalled lifter. The surface should be mirror smooth. 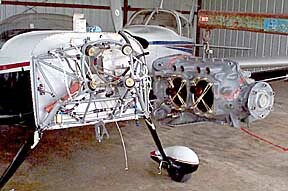 One cam lobe and its pair of lifters was in this condition and was the reason why the bottom end of the engine was disassembled for overhaul. No doubt this is where the metal in the oil was originating. Spalling is a fatigue failure, and may have been precipitated at some time by a stuck valve which caused the cam lobe to hammer on the lifter. Once the lobe was damaged, it took out the other good lifter that it contacted. So......what do you do if you tear down your engine and find stuff like this? No, it is not necessary to look for the nearest fourth floor window. Believe it or not, there are very nice people who will take your slightly worn crankcase, crank, and cam (well.......maybe not the cam in my situation........) and in exchange for your cash, send you back lovely, reconditioned engine parts. The crank, rods, cam, lifters, gears, and other steel parts were boxed up and sent to Rick Romans in Tulsa, Oklahoma. The case was also sent out for zyglo inspection and line boring (Crankcase Services, 877-835-9274, Sand Springs, OK). This will repair the case so the bearings will fit tightly acording to specs. The cylinders are suitable for rebuilding and/or chroming, but since the bottom end is going to be like-new, I decided to pop for new Millennium jugs from Superior Air Parts. Included will be new barrels, heads, valves, guides, springs, rings, and a set of matched 160hp pistons.